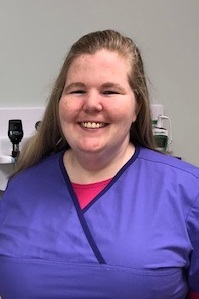 Patricia Hohmann, LPN, joined Emergency One in 2018 as a Licensed Practical Nurse. She received her degree from Ulster Boces in 2018. Prior to Emergency One, Trish worked for The Arc of Ulster Green in both residential and nursing services. Trish now joins the clinical team at Emergency One, spending time in all our facilities located in Kingston, Hyde Park and New Windsor treating our walk-in urgent care patients. In addition, Trish has been certified as a breath alcohol and drug screen technician, qualifying her for DOT and non-DOT testing. She conducts pulmonary function testing, audiograms and FIT testing and other OSHA required exams for our occupational health services. In her spare time, Trish enjoys riding horses and hiking with her dog. Site maintained by Patrick Stephens. Contact patrick.stephens@gmail.com. EMERGENCY ONE strives to be an excellent-care facility by providing the highest quality of health care services in a patient-friendly environment. We know that the quality of caring for our patients, clients, employees, community and all that we serve and who serve us, is just as important as the quality of care.